How to Reset Laptop BIOS Password. If you have forgotten the laptop BIOS password, so you will not be able to enter BIOS settings or change the BIOS settings on the laptop. This will be a problem if you want to re-install your Operating System. There are several methods can be tried to reset the BIOS password in order to be able to access your computer again. Here I will share the tips to reset bios password, please read this article until finish. The first way is to disassemble the laptop and then find Battery BIOS or better known as CMOS Battery, rounded like a coin. Unplug the battery then let stand for a few minutes then plug it back into the place. By doing this, usually the bios password will be lost by sending it back to its original state. 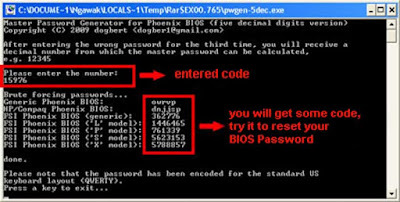 If the first tips can not reset your bios password, may you need to tray this second way. In this second tips You you will be assisted by software that can reset the BIOS password without having to disassemble the laptop. This way is simpler and more practical without having to bother using a screwdriver to unlock the laptop bolt. 1. Make sure you have Pwgen-5dec Software, which will help you to reset the Password Bios. 3. Each Laptop brand has a different way to get into Bios Setup.You will be asked to enter a Password, enter any password three times. After that, the computer will display 5 to 8 character code, like the example shown in the picture below. 5. Run the Applications that have been downloaded earlier on another laptop, then type the code that has been wrote at the part Please Enter The Number. Type one of the code that has been obtained from the application to your the laptop. This simple way usually works for reseting the bios password on the laptop. The application can only be used to Reset Bios Password of Phoenix BIOS, for the other Laptop BIOS types can be downloaded here. 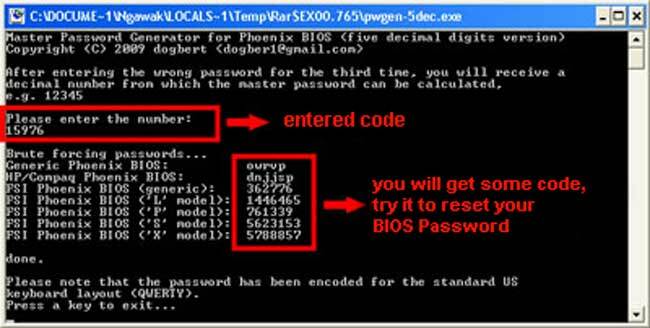 If both of the above methods have not successfully reset your Bios password, you have to try the last way. The third or last way is resetting bios password using special flash tools. BIOS IC on the main board will be removed first using a blower or solder, then insert the IC BIOS into flash tool to be loaded a new BIOS file. To do this third way you must have the same bios file with BIOS will be reset, then replace the bios IC of your laptop's motherboard using blower, insert bios IC to the flash tool. By doing this way you have successfully reset the BIOS password, but it takes longer and the process is rather long.